How "Everyday" Was Eddie Guardado? Everyday Eddie Guardado has spent a lot of days in the Twins bullpen. 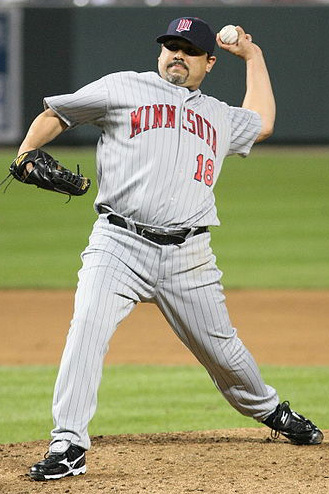 Twelve of Guardado's 17 major-league seasons were spent playing for the Twins, and he added an extra four years as their bullpen coach under Paul Molitor's regime until he was let go this past fall. This is no joke. The Twins honestly believe they will be better than .500 because of their pitching, especially with LaTroy Hawkins at the end and Everyday Eddie Guardardo, J.C. Romero and Bob Wells setting up. "We feel pretty good about our ability to pitch and play defense," says GM Terry Ryan. "We can surprise some people." At the time, the Twins were coming off of four straight 90-loss seasons, so it's hard to fault Gammons for thinking an above-.500 season was laughable. The Twins finished 85-77 that year, proving Gammons wrong, however—despite a very good year from Guardado—the Twins bullpen finished the year with the 5th-worst bullpen ERA. We know that at some point before 2001, "Everday Eddie" took hold as a nickname, and now, nearly a decade removed from his final major-league pitch, we can look back and decide: was that really a fitting nickname? Obviously Guardado didn't literally pitch everyday, it was hyperbole, but the nickname implies a couple of things: 1) he pitched in a lot of games, to the point where it might seem like he has pitched in every game, and 2) he pitched on zero days rest regularly, giving the impression that he was available everyday. But were either of those things true? Let's start with games played. In 1996, Guardado's first full season as a reliever, he appeared in 83 games which was tied for the league-lead with Tigers' reliever and international man of mystery Mike Myers. From 1996 through 2000 (remember, this nickname was established sometime before March of 2001), Guardado appeared in a total of 364 games, the 4th most among pitchers in that span behind Robb Nen, Buddy Groom, and Mike "Voice of Shrek" Myers. That's a lot of appearances. Not the most, but a lot. Considering he played for the same team during during that span, unlike the players ahead of him, and that his "Everyday Eddie" is alliterative, it's reasonable that he'd get this nickname by playing in a bunch of games. And keep in mind, the Twins were abysmal during this stretch, so the fans were likely desperate to latch on to anything. Now let's look at the second possibility: did Everyday Eddie pitch a lot with zero days rest? A quick play index shows that in all of baseball history, Guardado had the 11th most games played on zero days rest among all pitchers. He sits behind three Hall of Famers (Mariano Rivera, Lee Smith, and Trevor Hoffman), some memorable good relievers with long careers (Jesse Orosco, Jose Mesa, and Francisco Rodriguez), and of course Mike "He Keeps Showing Up Like That Killer in the Halloween Movies" Myers. Both are true: Guardado pitched in a lot of games and frequently pitch on zero days rest—he truly earned his "Everyday" nickname (and of course the alliteration really helps). However, I think that it is only fair that he henceforth shall share the nickname with Mike Myers. "Everyday Mike" may not have the same ring to it as "Everyday Eddie", but if anyone complains, they can just zip it. → How "Everyday" Was Eddie Guardado?